AAA Fence Company is a full-service fence dealer and contractor. 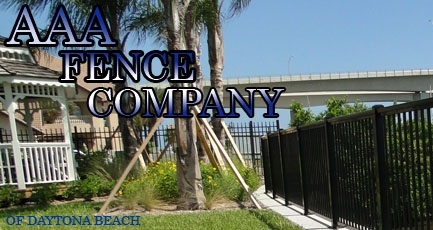 We are able to fulfill any fencing need, residential or commercial, throughout the central Florida area. Since 1958, AAA Fence Company has been at the same location serving the local communities fencing needs. known across the southeast for our special events team. We travel to air shows, spring break events, and also work on and off the track at Daytona International Speedway. Here at AAA Fence we strive to provide the best fence installation experience for every customer every time. If you need a fence to last, AAA Fence Company is for you. Opening and closing your gate by hand can be a time-consuming and physically challenging process depending on the type and size of gate you have. Gates are just as important as fencing since they offer you an opportunity to control who enters and leaves your house. Picket fences come in a wide variety of materials, but the most common are vinyl and wood. If you are getting a dog for the first time or adding another dog to your family, dog runs can be very useful. Privacy fences come in many different styles, colors, and materials. Steel fencing will add a look of style and elegance to almost any fencing project. Steel fences are generally maintenance-free and very strong. Chain link fences, often referred to as cyclone fences, are the most common style of fencing installed in North America each year. Wrought Iron Fences have a “grain” that resembles wood since it has lower carbon content than that of steel. Metal fencing comes in two major categories. The first category for metal fencing is wrought iron, which is the standard metal fence.